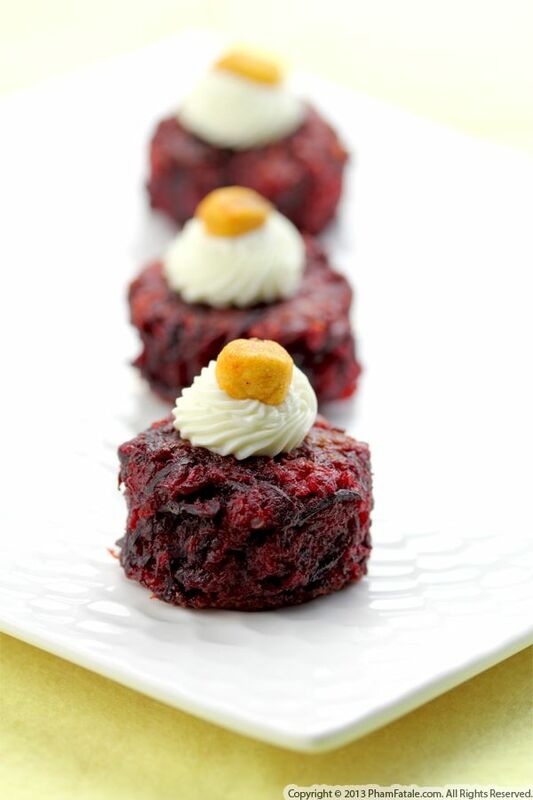 I'm presenting to you another vegetarian recipe for Meatless Monday. I pan-seared Portobello mushrooms that I stuffed with lentils and various colorful vegetables. Our family is heading to Europe this summer and I'd like to be able to fit into a bikini this season, so this hearty, yet super-healthy dish will not only satisfy our taste buds but will also help us look trim in a few weeks. The recipe is gluten free because we recently found out my mother-in-law is gluten intolerant. 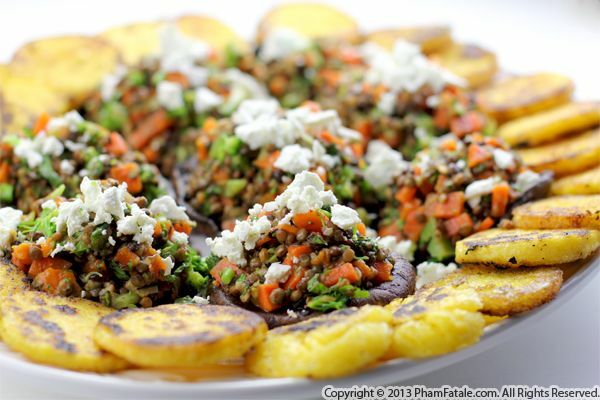 I served the mushrooms with pan-fried polenta medallions and garnished the dish with crumbled French feta cheese. 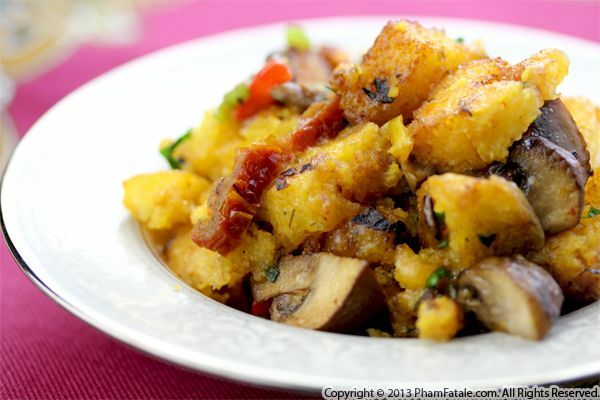 I developed this new stuffing recipe when I had leftover polenta croutons I had fried for making salad. The preparation is the same as for bread stuffing. I flavored the polenta stuffing with earthy ingredients such as brown mushrooms, chanterelle mushrooms, sun-dried tomatoes, red, orange and yellow bell peppers and marinated artichokes. This stuffing version is perfect if you have gluten-inloterant guests on Thanksgiving. And you won't be missing bread, either. Also, you could serve it tamale-style in corn husks to keep it warm. If you're putting together a more elegant Thanksgiving meal this year, consider these appetizers. They are a great conversation starter. The appetizers connect familiar holiday ingredients--roasted butternut squash and corn--in a wholly unique way. The primary ingredient in the appetizer is a mash of butternut squash and fromage blanc. 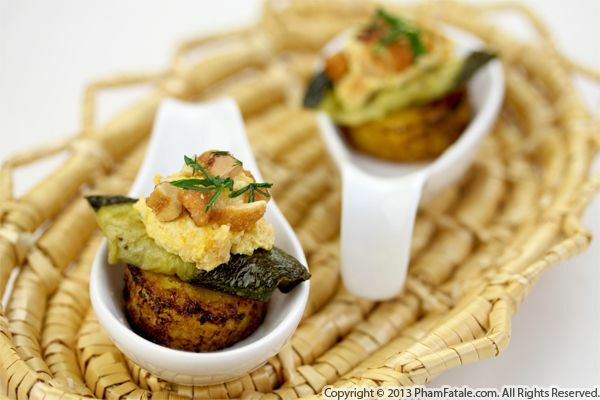 I nested the spread in a roll of grilled zucchini on top of pan-fried polenta medallions. For a nice contrast of texture and color, I garnished the elegant appetizers with honey-roasted nuts and a sprinkling of Italian parsley. I'm planning on serving 5 or 6 appetizers on Thanksgiving and will be sharing them as I make them throughout the month.